Who is the supplier of this fire pit? - Who is the supplier of this fire pit? Hey JoJo, ethanol fire pits like this can be found very easily online. There is a huge range available. Fire. An obvious way to bring the second element, fire, into your outdoor space, is to install a fire pit or outdoor fireplace. If you’d love an outdoor fireplace, brazier or a beautiful fire bowl like this one, according to feng shui principles, it should be installed in the south sector of the garden, which represents fire. BEGINNER’S TIP: Round shapes are also considered auspicious in feng shui theory. 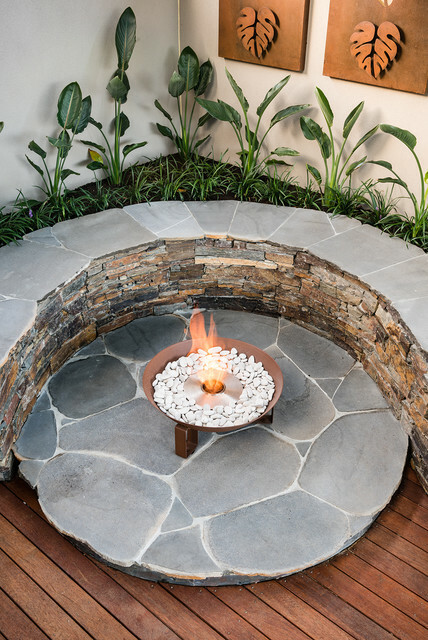 The designer of this Melbourne garden has cleverly used a circular fire bowl to repeat the shape of the bench and stone platform beneath it. One of many ways natural stone can look when mixed!